Happy Sunday everyone! I hope you've all had a good weekend. This week, I visited Paradise Wildlife Park in Broxbourne, Hertfordshire with my family. I love family road trips and this one was no exception, but there was a special reason for this trip. To celebrate my sister Rowan's 21st birthday earlier this year, we clubbed together as a family for a different kind of birthday present - a tiger feeding experience! Tigers have always been her favourite animal and I knew there were all sorts of up close animal experiences on offer which would make a great present. 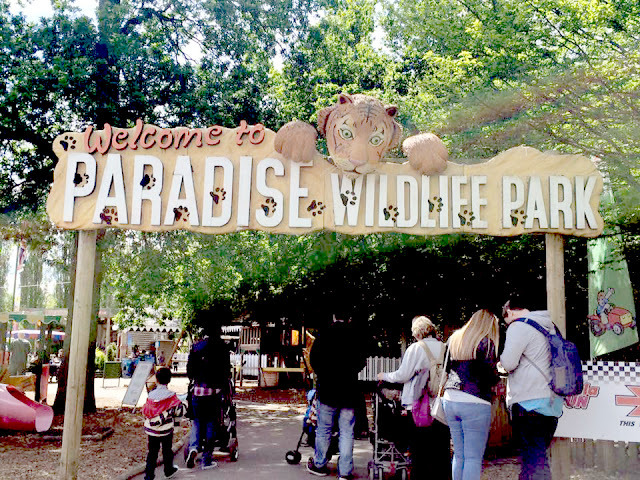 After doing some research, we decided to visit Paradise - it was actually first mentioned to Paul and I by a couple we met by the tiger enclosure at Busch Gardens in Florida, who said it really wasn't as good as Paradise! Rowan was able to get up close to the tigers right next to the enclosure, and feed chunks of meat to one, Aleena, by hand through the bars! Only one person can book into each available time slot so this was with one-on-one guidance from the keeper who, incidentally was named Tony - think about it. 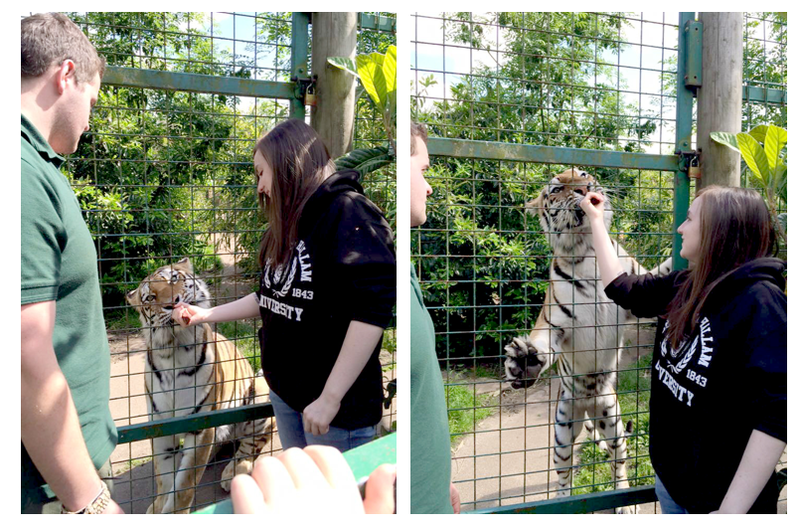 He gave us lots of information about the tigers as they were being fed. Did you know, a tiger's tongue is so rough that if it was to lick your hand 5 times, it would draw blood? It was a great experience not just for Rowan but the rest of us too - I've definitely never been that close to a tiger before and we had a really good view, being only a few paces away behind a second barrier, so we were able to get lots of good photos for her! I was also really impressed by Paradise Wildlife Park as a whole. There were lots of animals to see, but the park itself was quite compact and easy to get around, and they really made the most of the space. Most of the enclosures had raised walkways so you could easily see the animals inside. A great day out and definitely worth the drive, and the 6am wake up call! The blurb: I’ll tell you what happened because it will be a good way to introduce my brother. His name’s Simon. I think you’re going to like him. I really do. But in a couple of pages he’ll be dead. And he was never really the same after that. 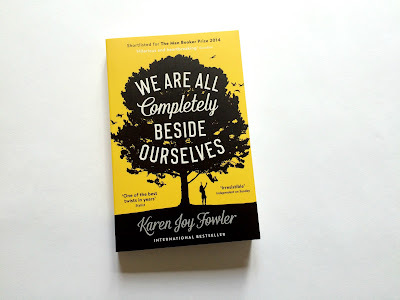 This book has been on my radar since it first won the Costa Book of the Year award in 2013. I was intrigued, knowing that it was a story about mental illness which I think is always an interesting topic and especially as the author is a registered mental health nurse, I was really interested to see what kind of insight this would give. I wasn’t disappointed! The story is narrated by Matthew who attends a day centre for mental health patients. He has decided to write his story down in order to make sense of his illness and past events, in particular the death of his brother Simon. 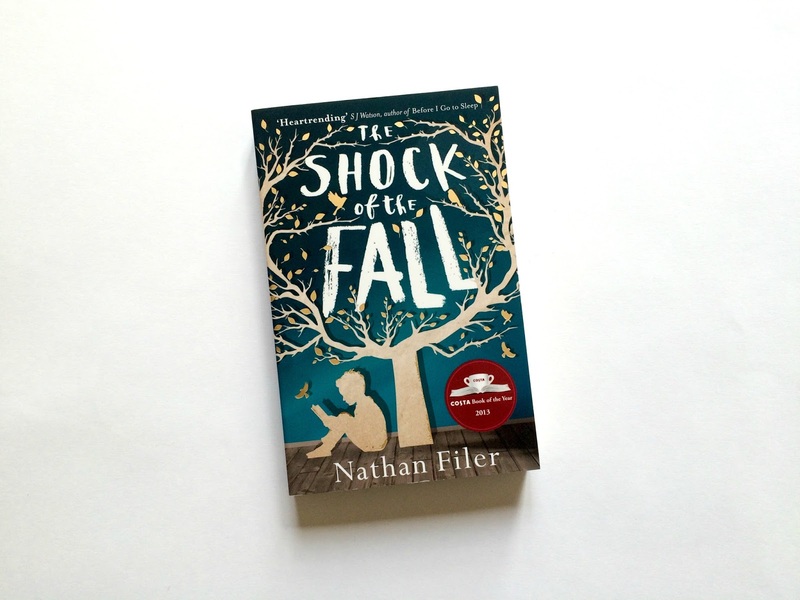 The reader learns very early on that Simon died when both boys were much younger while on holiday, and that the mixture of guilt and grief Matthew is feeling have acted as the trigger for his descent into mental illness, however the exact circumstances are not revealed until the last part of the book. This adds suspense which I loved and I really wanted to keep reading to find out what happened to Simon, but I think Matthew’s own description of his experiences is even more intriguing and really well written. You gain a real insight into schizophrenia as an illness and how it manifests itself, but the story is also a very interesting look at the approach of the health service to mental illness; Matthew writes a lot about the kind of routines imposed on him and his fellow patients, and his feelings towards the staff on the ward. The story isn’t the easiest to follow at times; a few chapters are written out of chronology and you have to kind of figure out for yourself where certain parts fit into the timeline, but this reflects Matthew’s complex frame of mind, and I think if anything this exhibits Nathan Filer’s skill as a writer. Different fonts and spacings are used at different points in the book which are useful in keeping up with which setting Matthew is writing in at the time – sometimes on an old typewriter given to him by his grandmother at home, other times at the day unit. He is a brilliant protagonist and one that you can easily sympathise with; equally, the supporting characters are all wonderfully realised and all felt very real. Filer describes everything beautifully. Whilst I wouldn’t say that I found this book upsetting, it was definitely moving and often very sad to see how Matthew changes from an innocent little boy to an adult experiencing a great deal of confusion. I finished this book over the space of a couple of days, and probably would have finished faster if I’d picked it up to read over a weekend! A very compelling book and definitely worth a read. A very moving book, telling the story of Matthew who is suffering from schizophrenia following the death of his brother some years ago. Brilliant characters and wonderful writing combined to provide a valuable insight into the experience of both mental illness and grief. Definitely recommended. The blurb: Bilodo lives a solitary life, routinely completing his post round every day and returning to his empty Montreal apartment. But he has found a way to break the monotonous cycle: he has taken to intercepting people’s post, steaming open the envelopes and reading the letters inside. And so it is that he comes across Ségolène’s letters. She is corresponding Gaston, a master poet, and their letters are composed of haiku. Moved by the simplicity and elegance of the language, Bilodo begins to fall in love with her. But when tragedy strikes unexpectedly one day, Bilodo is faced with the prospect of being deprived of the one fulfilling part of his life. Confronted with the awful possibility of losing his beloved’s poetry for ever, to what lengths will he go to protect his obsession? 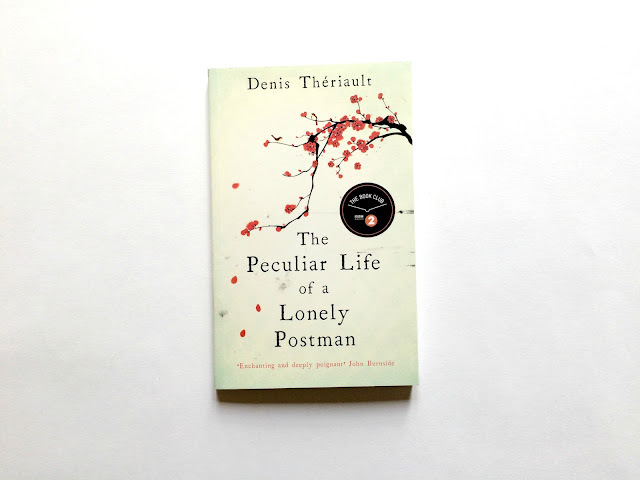 Thériault’s haunting writing vividly conjures up the reality of one man’s life and fate, with all its tragic, comic and beautiful moments. Something I’ve learned from reading this little book and then having a quick browse through some Goodreads reviews, is that I’m more likely than others to appreciate a story as just exactly that. A common theme in the reviews I read was isn’t it a bit weird, a postman who opens other people’s letters even though it’s illegal? I don’t understand why anyone would do that?’ Definitely a little creepy, but that aside, what you have is a quirky little tale about a person who is very lonely in the world, with apparently only one fairly mean person to call his friend, and does what he can to make life more interesting, right or wrong. It’s a very slim book and a fairly enjoyable way to spend an afternoon. I thought it was beautifully written with lovely descriptions, and full of interesting snippets about haikus and their history as an art form. Bilodo is a pretty likeable character despite his questionable motives, but I think because there is hardly any speech in the book, it was hard to get a full grasp on any of the characters. There isn’t much to say about the plot without giving away the little twist near the end, but suffice to say that the book’s conclusion, and the way it tied in with the ongoing theme of life coming full circle, left me with more questions than it answered. Having said that, I thought it was a clever way to end the story. If you’ve read it, you will know what I mean! Other than that, I thought it was an enjoyable story about an obsession gone a little bit too far. I didn’t love it but I didn’t hate it either – hence the 3 stars! Maybe give this a go if you’re looking for a shorter read between books, or something a little bit different. 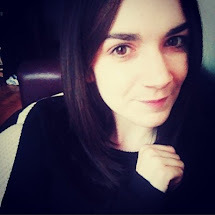 It's been a while since I wrote a weekend post, but truth be told I haven't really been doing anything that exciting with my weekends! 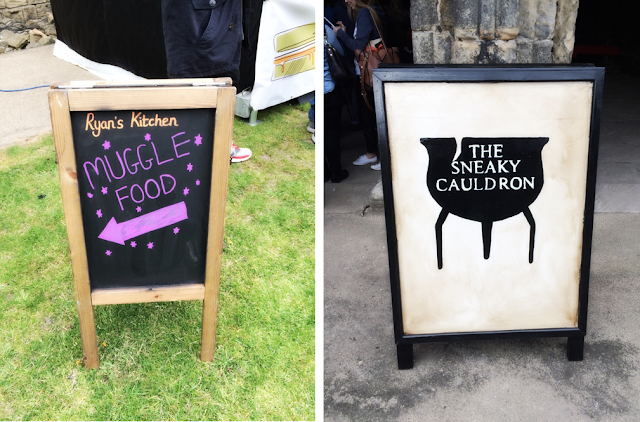 This week is a different story though, starting with Friday night when Paul and I went to a pop up Sneaky Experience screening of Harry Potter and The Deathly Hallows Part I at Kirkstall Abbey in Leeds, which was pretty cool! The blurb: What if you grew up to realise that your father had used your childhood as an experiment? Rosemary doesn’t talk very much and about certain things she’s silent. She had a sister, Fern, her whirlwind other half, who vanished from her life in circumstances she wishes she could forget. And it’s been ten years since she last saw her beloved older brother Lowell. Now at college, Rosemary starts to see that she can’t go forward without going back, back to the time when, aged five, she was sent away from home to her grandparents and returned to find Fern gone. This is completely different from anything I’ve read before, and that’s all I can really say without giving away the twist! The best way to read this book is to go in knowing as little as possible, so this is going to be a very short review as I really don’t want to give anything away that might spoil it for any new readers. I will say that this was a very compelling, smart and thought-provoking read with a highly interesting subject matter. The blurb intrigued me right from the start and it went straight on my to-be-read list, and I’m very glad that it did. Rosemary’s father is a psychologist (not technically a spoiler, if you’ve read the description!) and although some of the things discussed were already familiar to me from studying an A-Level in Psychology, I have come away feeling like I’ve learned so much. I didn’t feel like this was forced either; the book was very well paced and easily digested despite dealing with a complex issue. You might be wondering why I’ve given it only three stars if I liked it so much, and that’s because I felt like most of the last part of the book was quite irrelevant. I’m just one reader so this might be different for everyone, but I felt that I got all the answers I was seeking about Fern, Lowell and what happened in Rosemary’s family about two thirds of the way through, and everything that followed seemed unnecessary and harder to stick with. I think it’s obvious that the author feels very strongly and had more to say about the things discussed throughout the story but I did feel a bit preached to by the end, and I just think it could have ended earlier and still had the same effect on the reader. Other than that, a fantastic read – highly recommended!